One of several meetings called by Makerere university to resolve issues with the staff associations. The appointments board has directed reinstatement of two suspended leaders. Kampala, Uganda | THE INDEPENDENT | The Makerere University Appointments Board has directed the reinstatement of two suspended staff association leaders. They are Bennet Magara, the chairperson Makerere Administrative Staff Association- MASA and his General Secretary, Joseph Kalema. The duo was suspended together with Dr. Deus Kamunyu, the Makerere University Academic Staff Chairperson by the Makerere University Vice Chancellor, Prof. Barnabas Nawangwe for staff incitement. In their suspension letters, Prof. Nawangwe disclosed that the two staff led a mob on December 20, 2018, which attempted to disrupt the University Council, the supreme policy making organ of the university. “This mob was thwarted by the University Security,” Prof. Nawangwe stated. Their suspension led to a nearly one month staff sit-down strike at Makerere until the university council promised to expedite hearing of their suspension. The duo through their lawyer, lawyer, Isaac Ssemakadde asked for temporary relief including lifting their suspensions pending the hearing and determination of their matter on March 31st. In their application, the duo said their suspension by the Vice Chancellor was arbitrary. They asked the Board to order their reinstatement and payment of their salaries. “The Board has noted your application, considered it and agreed to the application. Suspension is hereby lifted. We will now hear you as fully reinstated members of staff of the university,” ruled Jolly Uzamukunda Karabaya, the Appointments Board chairperson. In her preliminary ruling, Uzamukunda promised the parties that the Board will practice fairness, show no bias, observe natural justice and conduct an expeditious hearing. “Your application which you made on the 13th of March for lifting of suspension is hereby given. According to the constitution and common law, you are presumed innocent until proven guilty,” Uzamukunda said. 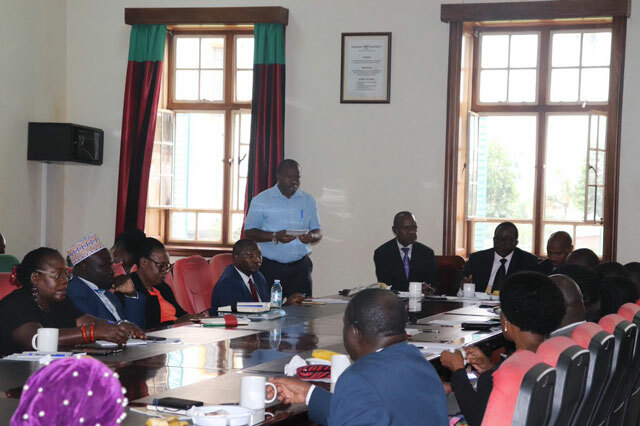 The Appointments Board was attended by James Ninsiima, Dr. Sarah Ssali, Masaka LCV Chairperson Jude Mbabali, Prof. Tumps Ireeta, Kiryoowa Kiwanuka and Prof. Eria Hisali who represented the Deputy Vice Chancellor in charge of Finance and Administration -DVC F&A. During the session, Isaac Ssemakadde, the lawyer of the applicants objected to the presence of Hudson Musoke, a lawyer from the university who had attended as a representative for Henry Mwebe, the Director Legal Affairs. The matter was adjourned to April 12, 2019 at 10am to enable the prosecution led by Esther Kabinga and Naomi Kiconco Ochieng from the institution’s Directorate of Legal Affairs to avail the accused staff with all the relevant witness statements and other documents to be relied on by the University in presenting its case. Ssemakadde welcomed the preliminary ruling, saying it was a positive signal by the new Board. “This is a positive signal that the new Appointments Board can be trusted to reverse the negative track record of injustices left behind by Bruce kabaasa (former Board Chairperson),” Ssemakadde told URN shortly after the Board hearing.